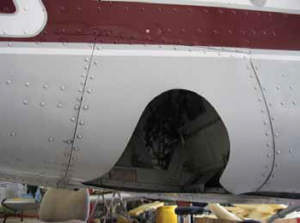 210 Gear Doors – The Un-Solution | Tennessee Aircraft Services, Inc.
Much ado has been made over the years about the single engine Cessna landing gear systems’ reliability. Some problems are the doors won’t open, the doors won’t close, they sag open in flight, they crack, and a few others. Blame for the systems’ perceived persistent problems have been attributed to everything from the basic design, to pilot error, to improper maintenance practices. What ever the cause, there have been only a couple of serious attempts to alter the system for improvement. I have heard of a modification that locks the landing gear in the down position rendering the plane similar to the 205/206 series. The 210 flies well enough with the gear locked down and all doors closed, but lacks the extra interior space a 205/206 offers. The 1967 and newer 210 with the gear down is a bit faster than the 205/206 series because of the cantilever wing. I’ve never seen a 210 modified like this and certainly think it is the wrong approach. 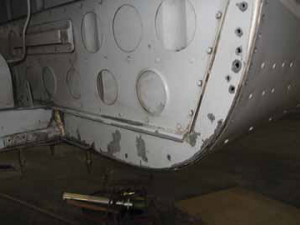 The most common alteration to the Cessna 210 landing gear system is known as the Uvalde Gear Door Removal STC. Originally, this mod seemed a good solution to the issue and loosely mimicked the 1979 and newer Cessna version of the system. Over time, it has become obvious the Uvalde system did not quite accomplish its goal of eliminating the gear door problems. The early models of the 210 had a complex hydraulic system for operating the retractable landing gear. It was further complicated by hydraulically actuated flaps that shared the same pump and hydraulics as the landing gear. Those early systems had some reliability issues that were seriously complicated by general aviation mechanics unprepared and/or unwilling to properly troubleshoot such a system. Cessna steadily improved and simplified the hydraulic system. 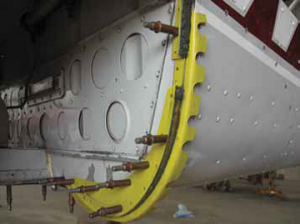 The flaps were changed from hydraulic to electric, thus reducing scope of the hydraulics. The engine driven pump was replaced by an electric pump integrated into the hydraulic power pack. Cessna eventually designed the system without the main landing gear doors and up lock mechanisms or the controllers that operated them. In this final form the system has proven very reliable. Unfortunately, the only significant system problem solved by removing the doors per the Uvalde STC, is the doors’ propensity to develop cracks near the hinge and actuator attach bracket. 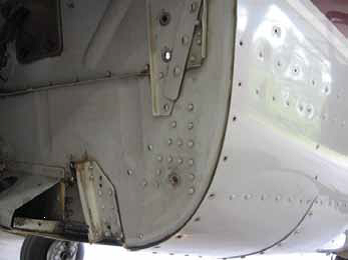 It is interesting, the cause of door cracks is the easiest and least expensive of the landing gear retraction system problems to prevent. Proper rigging of the door actuators will relieve undue stress on the door hinge in the closed position and lower airspeeds with gear in transit will just about allow the doors to last indefinitely. The most problematic issue with the hydraulic system is the door activation solenoid and the electrical components that activate it. Ironically, it is very easy to troubleshoot with just a few bits of information. With doors removed, the most visible indicator of a system failure is eliminated. While the door removal STC removes the doors and their actuators, the problematic solenoid and related switches remain. So, what to do when you want to undo that gear door removal mod? Step one – find wallet, Step two – immaterial since you completed step one. Sorry, I couldn’t resist. Step 1: Locate as many of the components required as possible, probably from aircraft salvage yards. These parts will include aft main gear doors, main gear leg doors, aft gear door actuators (2 each), main gear leg actuator (1 each), gear leg door actuator bell crank, aft main gear door fairings (4 each), aft wheel well bulkhead, forward fairing supports (2 each) and two little triangular shaped blocks that mount at the inboard aft corner of the gear leg doors. We’ll discuss some of these parts as we go along. Step 2: Research the aircraft parts catalog for all the hydraulic lines and flexible hoses that must be reinstalled. You will also need new hinges for all four doors. Step 3: Find a shop willing to take on the task. The last step may be the most difficult. Judging by how few shops will work on basic 210 landing gear repairs, I would imagine even fewer would take on the undoing of the Uvalde STC. Before showing the wheel well cover skin installed in lieu of the door. Looking forward with wheel well cover skin removed. Aft bulkhead with Uvalde wheel well cover and flange removed. Shows where original bulkhead was trimmed to match outer skin of fuselage. Door temporarily installed showing the gap to be covered by the two fairings. Pieces fabricated to create aft fairing support bulkhead. In most service manuals when a reinstallation of some item is called for you might expect to read an instruction that goes something like this: “reinstallation is in reverse order of installation.” Unfortunately, in the Uvalde case, I have yet to see the original installation drawings or check lists. I can only assume that most owners lost or threw away all the documentation that went along with the installation. Most of the work needed is obvious so we’re not in too much trouble. The hands on craftsmanship required to do this job does not translate well in a “how to” article, so I’m just going to give you some highlights to look forward to. The actuators just bolt in place and the hydraulic lines get connected as noted in the parts catalog and diagrams found in the service manual. Those planes that used accumulators still have them, so no worries there. Just be sure they are properly charged before the final test gear swings are made. The used doors will need new hinges because none of the rivet holes in the old hinges will align properly. We attached the new hinge to the door first because it is easier to rivet with the door on a bench. The door is then slid into place in the closed position and set so it has as even spacing as possible all the way around its perimeter. When satisfied a good fit is made, drill and cleco the hinge from the center outward. Check the fit after every few holes to be sure it all stays put. This process works for all four doors but gets a little complicated on the aft (clamshell) doors. The clamshell doors are more three dimensional in their pivot action than the leg doors because they go down the side of the cabin then inward on the belly. Sliding the door up or down in the gap between the cabin skins allows a certain amount of adjustment. The problem fit area is the inboard end of the door when closed. It may be too far forward or aft and no amount of positioning in the hinge will help it. Don’t bother trying to flex the door as it is very stiff and any real bending will result in a kink in the inside structure (you can read that as time to buy another door). The trick here is to bend the hinge laterally. To adjust the hinge laterally is an easy process to demonstrate but very difficult to describe, but I’ll give it a go. Let’s say when the left clam shell door is in the closed position, its inboard portion is too far forward inhibiting proper closing. Remove the hinge pin to remove the door and leave the top hinge half attached to the plane. Reinstall the pin to maintain the shape of the pin holes when we hit the hinge with a mallet and brass punch. Carefully strike the aft end of the hinge from the inside of the wheel well causing it to move out about 1/8 of an inch. The forward end of the hinge can be struck from the outside moving it inboard. Hold a straight edge on the outside of the hinge to see the bow that has been created and use the mallet/punch to make all segments of the hinge touch the straight edge. Getting the hinge perfectly straight is an absolute necessity for inserting and removing the hinge pin. Reinstall the clamshell door and check the fit at the bottom inboard two corners. On the forward frame of the clamshell door near the inboard forward corner, is a small metal bumper pad that should just barely touch or even not make contact with a small steel scuff plate on the wheel well frame. There is no procedure in the service manual for bending the hinge so it follows there is no published limit for the bend. The mechanic just bends until the fit is made or his/her comfort zone limit is reached. On the tube gear models, 1970 and up as shown in the photos, there is a fairing forward and aft of the clam shell doors. These fairings are simple aluminum sheet rolled to match the shape of the forward or aft edge of the clam shell door. The forward frame is an easy install as is just rivets back into the original position. The fairing aft of the door requires more effort. The wheel well aft bulkhead originally had and extra “lobe” on each side of the plane that made the support for the shape of the aft fairings. During the door removal process these “lobes” were cut off to the position of the structural side skin. A new bulkhead can be installed to get the lobes back if you can find the bulkhead. The bulkhead hasn’t been available from Cessna for quite some time. We are fortunate enough to have a new bulkhead in stock we use as a template to fabricate just the “lobe” portions. These lobes are then riveted on the existing bulkhead. The aft fairing can now be installed and attached to the new bulkhead lobes. 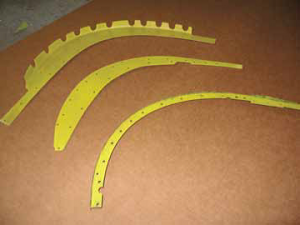 The clamshell fairings are best fabricated in house and made slightly oversized. This allows them to be custom trimmed to fit the replacement doors. 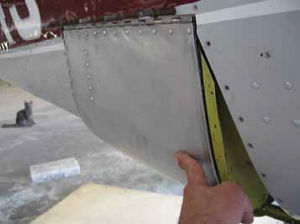 Also, fairings removed from other airplanes will have a different rivet patterns making them difficult to rivet with an even fastener pattern. These fairings are not structural but they are very visible so little details like rivet patterns can make an impact on the esthetics. As mentioned in the beginning, one of the causes of cracks in the clamshell doors is improper actuator rigging. In an effort to make the door fit tighter, a mechanic might adjust the actuator rod end for a shorter effective length. In this configuration the door makes solid contact with the wheel well frame before the actuator gets to its mechanical stop. The full power of the actuator will be applied to the hinge area of the door as long as it is in the closed position. This shouldn’t be an issue to most mechanics if they take just a moment to consider the geometry of the door actuator. The door open position is immaterial so we only need concern ourselves with the closed position. Ideally, the door would come to a fully closed position at the same instant the actuator reaches its mechanical stop. The door will be held in this position with just enough force to keep it closed and minimal stress on the hinge. There are too many variables to reliably state the cost to reliably state the cost to return your specific 210 to its original gear door configuration. Remember, there is no available kit packaged with detailed instructions and new pre-fit parts. Time will be expended locating parts, actuators get resealed, some parts may be custom fabricated, the hinges may have to be bent, and so on. In round numbers you can expect to get labor and materials in the $16K to $17K range. Just consider it your way of spurring on the economy.